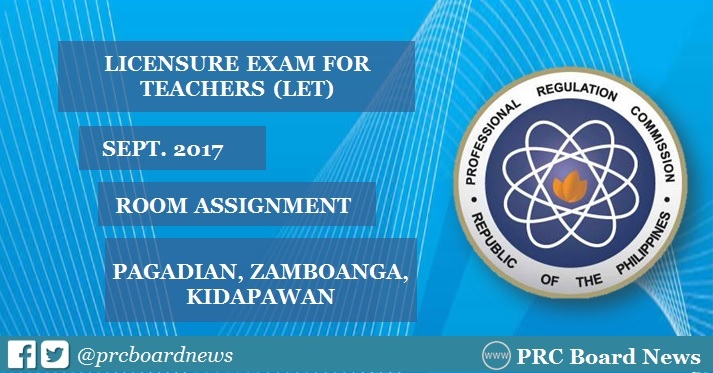 MANILA, Philippines - The full list of room assignments for September 2017 licensure exam for teachers (LET) in Pagadian, Zamboanga and Kidapawan has been released online. The Professional Regulation Commission (PRC) regional offices announced the names of qualified examinees together with the room, school and address of test center venue for the nationwide conduct of LET board exam on Sunday, September 24. PRC Board News will also update this site for the results of September 24, 2017 LET board exam. You may also check out the official website of PRC (prc.gov.ph) for more information.